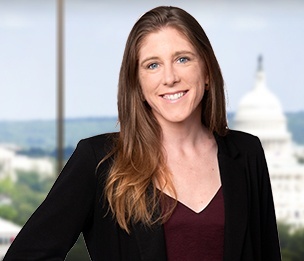 Jamie L. Lanphear is an associate in Dykema's Washington, D.C. office, and practices in the Products, Class Actions and Professional Liability Group. Jamie has experience representing major pharmaceutical companies in strict liability, negligence, failure to warn, and wrongful death actions. Jamie also has experience representing individual and corporate defendants in various types of actions, including product liability and mass tort, commercial litigation, and real estate litigation. Jamie has represented clients in state and federal courts and is experienced in handling all aspects of pretrial procedures, including drafting and arguing pretrial and dispositive motions, written discovery, depositions, and drafting settlement agreements. While in law school, Jamie served as a legal fellow for the U.S. Senate Judiciary Committee and was a member of the Board of Advocates, Jessup International Moot Court Team. She also served as a law clerk with the Health Care Practice at the East Bay Community Law Center, where she was successful in the appeals she brought on behalf of clients denied social security disability benefits. Jamie also maintains an active pro bono practice. Representation of pharmaceutical company in coordinated state litigation involving allegations of various injuries resulting from prescription medication. Prepared corporate witnesses for deposition, deposed fact witnesses and treating physicians, coordinated with expert witnesses, drafted multiple motions for summary judgment (granted in our favor, voluntarily dismissed by plaintiffs), coordinated discovery and document production across 1,000+ individual cases, and negotiated with plaintiffs lead counsel on various discovery-related issues. Representation of global products manufacturer in asbestos litigation. Handled all aspects of pre-trial discovery, including depositions and written discovery, drafted pre-trial motions, and prepared case for trial. Representation of Fortune 500 company in breach of contract dispute. Negotiated favorable settlement for client. Representation of individual in real estate dispute. Drafted motion of summary judgment, resulting in favorable settlement for client. Successfully moved to expunge lis pendens in multiple cases involving real estate disputes.